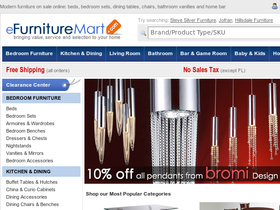 eFurniture Mart, online at efurnituremart.com, is the stop for finding a great selection of discount furniture. eFurniture Mart offers bedroom furniture, dining furniture, kitchen tables and chairs, sofas, loveseats, TV stands, media units, coffee tables, lamps and lighting, home decor, and much more. eFurniture Mart offers savings on top furniture brands, including American Heritage, Atlantic Furniture, Steve Silver, Jofran Inc., Lea Industries, Paragon, Furnitech, Design Element, Canterbury Home, and many more. But before you redecorate, get all the latest efurnituremart.com discounts, eFurniture Mart promotions, and eFurniture Mart coupon codes found here at RetailSteal.com. eFurnitureMart offers shipping within the continental United States and Canada via ground shipping and truck freight. Shipping to Hawaii, Alaska, and U.S. territories are possible with additional fees. See site for more information. eFurniture Mart offers discounts up to 15% with coupons on top brands like Atlantic Furniture, Cyan Design, Hillsdale, and others. Check out the discount coupons page. Save 10% on your purchase of Virtu USA Products from efurniture Mart when you use this coupon code online. Save 6% on all home decor from eFurniture Mart when using this coupon code. Shop now and enjoy. Save 15% on Atlantic Furniture from eFurnitureMart.com. Click here and use coupon code on purchases $500+. Save 15% on American Heritage products using this coupon code at eFurniture Mart. Click here to shop and save. Enjoy free ground shipping within the continental U.S. and Canada on any purchase from eFurniture Mart. Click here to save. Save 7% on the entire Wyndham collection from eFurniture Mart. Use coupon code to save. Save 7% and receive free shipping on Steve Silver furniture when using this coupon code at eFurnitureMart.com. Use code on purchases $300+. Save up to 60% on furniture from eFurniture Mart. Click here to save big on Jofran, Atlantic Furniture, Steve Silver, and others. Use our coupon code on Furnitech orders at eFurniture Mart online today to save 7% on merchandise. Save 15% on Chandra rug purchases of $100 or more when you shop online today. Use our coupon code to enjoy this discount. Click our link to head over to eFurnitureMart today and use our coupon code online to enjoy 15% savings on Jael and Talon light collections. Enjoy a 5% discount on dining room sets online at eFurniture Mart when you enter our coupon code at checkout. Shop vases online at eFurniture Mart today and enjoy a 5% discount with the use of this coupon code.